Bees, butterflies and those people who look closely at wildflowers are attracted to these spectacular wildflowers, but for different reasons. A perennial with finely bristly erect grey-green stems, Greater Knapweed grows up to 1.2m in height and its upper part branches freely. Knapweeds are readily distinguished from thistles by the absence of spines and prickles. Greater Knapweed leaves are alternate, stalked, dark green and slightly leathery; mostly they are pinnately lobed (but irregularly divided) with a few narrow leaflets. Flower heads, 3 to 5cm across, are borne singly or occasionally a few in an open cyme. Unlike Common Knapweed, which only occasionally has rayed flowers, the violet flowers of Greater Knapweed are nearly always rayed. Within each floret there are five stamens and a pistil of two fused carpels. Very common throughout Most of Britain and Ireland except for the far north of Scotland, where it is an occasional find, Greater Knapweed is a European native species that has been introduced to many other parts of the world including North America, where it has become naturalised but generally sparsely distributed across the central region and in parts of Canada.. 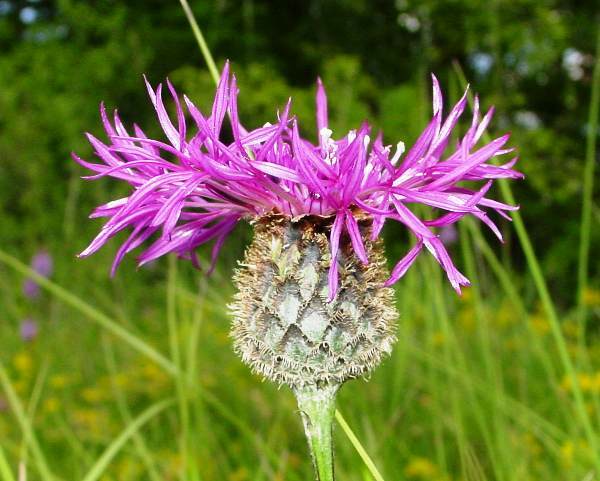 Greater Knapweed if found in dry grassland, in hedgerows, on chalk downland, and and on cliff tops on lime-rich soil. 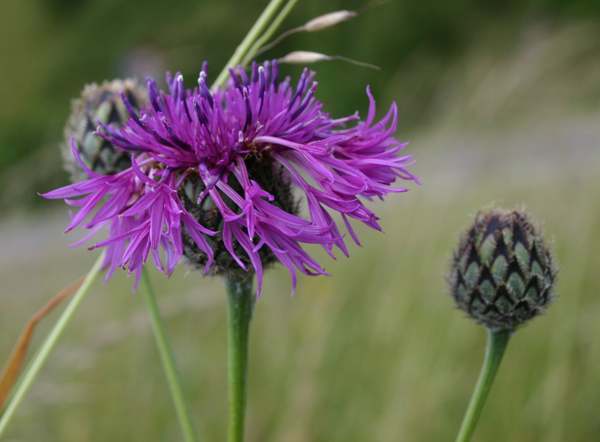 In Britain and Ireland Greater Knapweed flowers first appear in July (slightly later than those of Common Knapweed) and continue into September. 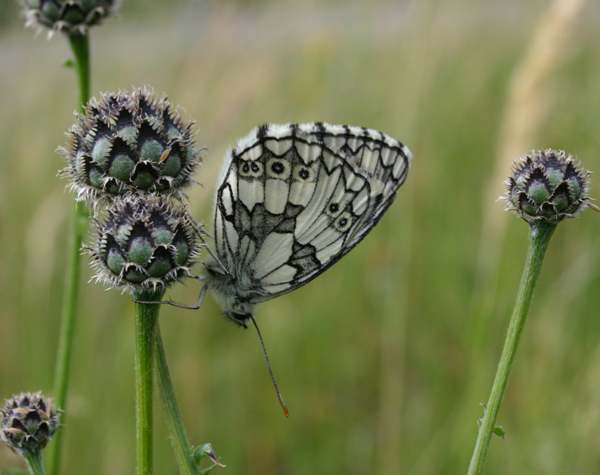 Insects, including bees and butterflies (notably the Marbled White Melanargea galathea, as seen in the picture above) , are very fond of these long-flowering plants. 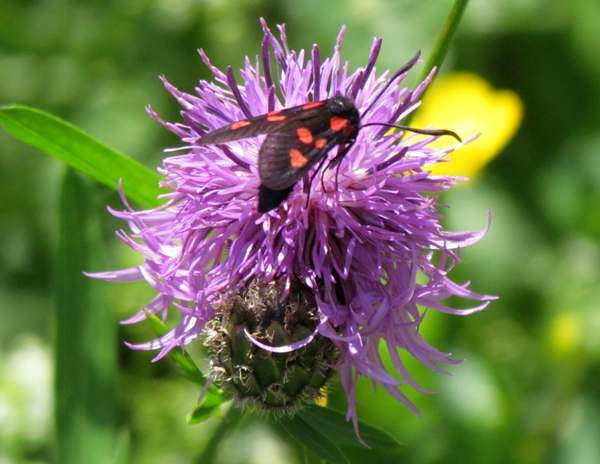 Burnet Moths, Zygaena species, are often seen in great numbers on Greater Knapweed Centaurea scabiosa and other members of the Centaurea genus. Centaurea, the genus name, comes from the Centaur Chiron, who used flowers of this genus as a poultice to cover a festering wound made by an arrow dipped in Hydra's blood, The wound was cured and so, the story goes, cornflowers and knapweeds were given the name Centaurea. The specific epithet scabiosa refers to an assumed capability of the leaves of this plant to treat scabies, a contagious skin infection caused by Sarcoptes scabiei, tiny mites that burrow into the skin and cause intense itching.